You know how frustrating it is to get stuck behind a really slow driver on the freeway? Not the one going the speed limit, the one going 10 miles per hour UNDER the speed limit? Not only is this annoying to you, it is also extremely dangerous to the person driving and the people around them. 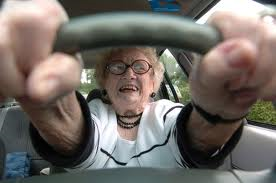 Driving slowly is one of the warning signs that someone might be getting too old to drive. Consumer Reports adds that some other things to look out for include repeat fender benders, a decline in cognitive function (not remembering where they are going, forgetting to turn the blinker on, etc. ), and even a reluctance to drive. So how old is too old? The bottom line is that there is no magic number in which someone is suddenly unable to drive. There are a lot of factors at play, including medical conditions and physical ability. That being said, the Centers for Disease Control and Prevention points out that at age 75 the percentage of people that die in accidents increases dramatically. This is not only because their driving abilities decline, but also because people at that age are much more susceptible to medical complications and injuries. Most of the time, the person who is too old to drive will not admit it. Driving is a right of being an adult. It makes them independent. They don’t want to give it up. That is why it is their loved ones’ responsibility to bring it up. If you have a family member or friend that may be getting too old to drive, it is important that you encourage them to get tested by a doctor to see if their cognitive abilities are where they should be to be safe behind the wheel. Even if seniors test well and are capable of driving, there are still things that should be done to make them better drivers. They need to make sure they are wearing the correct glasses while they drive. They can plan ahead to only drive routes they are familiar with and only drive during safe road conditions (no rain or snow/daylight). They may also want to take a defensive driving course at DefensiveDriving.com to brush up on all of the driving skills necessary to stay safe on the road. That way, you can feel better knowing they are safe, and they can enjoy the independence of driving for a little bit longer.